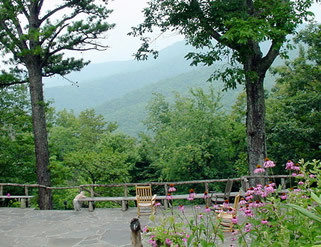 About 12 miles from Spruce Pine on the Blue Ridge Parkway, near Little Switzerland, is WILDACRES conference center, a mountain retreat of 1400 acres at 3300 feet in the heart of North Carolina's Blue Ridge Mountains. THE FACILITY: Because our fee is inexpensive, newcomers are often concerned about the facility and the quality of the workshop. Don't be! The beautiful lodge-type buildings blend the comfort of modern living with the beauty of the Blue Ridge mountains. The spacious two-bed rooms have private baths and three delicious family-style meals are served daily. There is an auditorium, library, dining room, meeting rooms and a canteen where you may purchase soft drinks, snacks, postcards and T-shirts. Wildacres is a lovely retreat — not a hotel. Bed linens and towels are furnished but there are no maids or bellboys. Also, there are no phones, TVs, or radios in the rooms, but pay phones are in the lobby. Smoking is not allowed in the rooms or any building at Wildacres. You may smoke outside. CELL PHONES: Some cell phones work on the mountain and some are a little tricky. We are on a mountain top between two towers, so you may have to walk around to find a sweet spot. Wi-Fi: There is free Wi-Fi for your laptop and you can usually get it in the lobby or on the porches. This is a limited service for you to get online, get your e-mail and get off. No downloading and they frown on doing business on your computer. If you need long computer sessions, there are several places in Spruce Pine that have free access. HEALTH ISSUES: There are a limited number of rooms for the handicapped. Keep in mind that the elevation is 3300 feet, some of the walkways are uneven flagstone and the dining room is down an incline. All participants should be in reasonably good health and capable of dealing with the terrain and stairs. Special dietary requirements (vegetarians, etc.) can usually be accommodated. Include this information with your application. ROOMMATES: If you do not have a roommate, we will assign you one. We do not have any private rooms. There is always hesitation about roommate assignments. We do a good job of matching people and many long friendships have been made. Also, you are not in your room that much. We keep you busy at Wildacres! There are classes, critiquing, homework, auditing other classes, time to sit in a rocker and chat, Gong Show practice -- not to mention time spent eating 3 full meals a day. There is also a program each evening, so roommates are not the problem you might anticipate. To help us match you up with a roommate, you must attach a page of information about yourself with your application. (This includes Alumni.) We need to know if you smoke, if you snore, if you are a day or night person, age (approximate), marital status and anything else that will help us pick out just the right person for you to share the week with. Include this personal information with your application. To make certain you like your roommate, bring your own writer friend. RECREATION IN THE AREA: Within a few minutes of Wildacres are tennis, golf, swimming, hiking, craft shops, gem mining, fishing, horseback riding and many scenic spots. Info will be in your arrival packet. 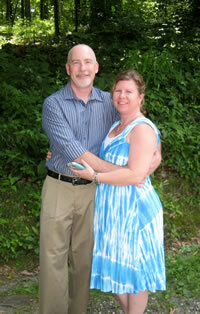 PHONE INFO AND EMERGENCY NUMBER: The Wildacres number to leave with your family while you are gone is (828) 756-4573 . This is an emergency number ONLY! The staff is small and locating people for phone calls can be inconvenient. There are two pay phones, one in each lodge. Phone cards are available in the canteen. There is a fax machine and the number is (828) 756-4586. There is a charge to send faxes. DIRECTIONS TO WILDACRES: On a North Carolina map, find Marion on I-40 (about halfway between Hickory and Asheville). From Marion, take NC 226 North (bypass) to NC 226A. Proceed to the "Wildacres" sign on the left. Follow the road to the Wildacres grounds. 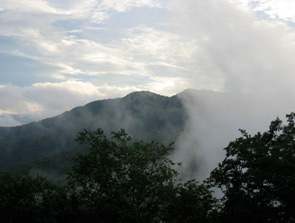 Wildacres is about 25 miles from I-40 and, although it is in the mountains it is a good road and easy to drive. The nearest airport is Asheville, NC (50 miles). From there you can rent a car. You will receive a detailed map with your acceptance letter. FLYING HINTS: Wildacres is about 1 1/2 hours from the Asheville Airport. Alternately, you could fly into the Charlotte airport which is about 2 hours away BUT your flight may be cheaper and your car rental much cheaper. Several people sharing a rental car is also a good idea. You may be able to arrange ride sharing on Facebook as the workshop date approaches.